Did you know that you can incorporate protein powder into many different things and use them in many different ways? EAS Whey Protein comes in different flavors, such as vanilla and chocolate, that you can use in different recipes! Protein powder is sometimes associated with boring shakes, but you can do so much more than making "boring" shakes and can be used in your daily lifestyle. 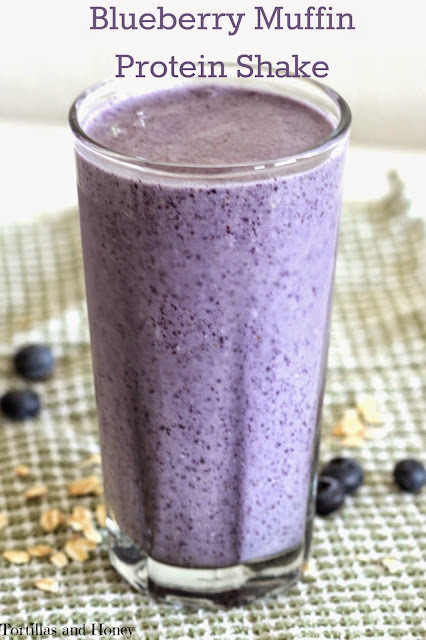 Today I'm sharing with you one of my absolute favorite recipes, something I make often as a quick breakfast as I'm running out the door, a Blueberry Muffin Protein Shake that tastes like blueberry muffins! Protein helps you build muscle and helps satiate your hunger so that you feel hungry less often. Helps boost metabolism. EAS Whey Protein Powder is a simple yet effective way to add protein, fiber, and other good-for-you nutrients into your every day lifestyle. I found this newly package EAS Whey Protein Powder while perusing Target the other day-- the lid now has a little clip that you can store the scoop instead of having to fish out the scoop and get powder all over your hands. This is currently my favorite shake! I make it all the time and have adapted it to my own taste over time. You have natural sweet flavors from the fruit, the oats and chia seeds to add some thickness and some fiber to keep you full until lunch. The original recipe didn't taste too much like a muffin, so I added cinnamon and some vanilla protein powder to help more reflect how I think of the way a blueberry muffin should taste. The vanilla protein powder adds some more sweetness and vanilla that comes through real muffins, and it adds some extra protein to the shake. This shake is an incredibly easy recipe to make. I portion out the fruit and put them in small baggies and store them in the freezer, so that I can easily pull it out in the morning without having to measure. I also like to portion out the dry ingredients in a small container. And sometimes I will portion out the nut milk, place it in an individual-sized to-go blender cup, that way everything is close to being ready in the morning! Then I just add the frozen fruit and the dry ingredients to the milk, blend, and I'm on my way in the morning! I'm notorious for running late, so this is an easy and delicious recipe to help me eat and feel better in the morning instead of heading to the shop and getting a breakfast burrito. To find more information about EAS Whey Protein Powder, please visit EAS Powder site. And for different recipes you can incorporate protein powder in, please visit Target Recipes using Protein Powder. There are also two deals currently happening: 1) From 4/19-5/23 5% cartwheel offer on any EAS item and 2) on 5/10 buy any 4 EAS products and get a $5 Target gift card. How have you incorporated protein powder into your everyday lifestyle? Add all ingredients in a blender (or mini single serving blender), pulse until all ingredients are fully mixed together. Note: You can play with the amounts of the ingredients, specifically the nut milk-- if you like it thicker, add less milk; if you like it thinner, add more milk! If you don't want it frothy and somewhat frozen, use fresh fruit!